Vampire Diaries | Is It Just Me? Throughout my convention travels I’ve been able to meet many creative people who I am now blessed to call friends, one amazing person is Angie Trombley of Creative Par-tees, a custom screened t shirt company that she started herself. After working with Dena and Bob Somerhalder and their company Built of Barnwood at various Vampire Diaries conventions they had received various requests for custom made t shirts, Angie decided that the best route to take was do it herself. Angie is the creative mind behind all the designs, and also creates the screens and prints the t shirts herself, she’s a wonder woman. while many may be aware of her creations focusing on fandoms, the business also covers any custom designs a business or person would wish for; including shirts for special events and charities. As a firm supporter of indie companies Creative Par-tees is one of my favorites, as Angie is at the helm and her family is along to support her, with he husbands and sometimes her kids travelling to various conventions to sell their shirts. Screen printing according to Angie is a very physical process and in hindsight she would have likely chosen to opt for a direct to garment printer as opposed to a screen printing press. And while she finds the process of printing the shirts therapeutic she is less than a fan of the clean up. Some of the aforementioned fandoms that Angie has represented on her shirts include Boondocks Saints, Breaking Bad, The Vampire Diaries and the extremely popular The Walking Dead, which happens to be one of Angie’s favourite shows. Most commonly requested designs usually feature either Damon Salvatore of The Vampire Diaries or Daryl Dixon of The Walking Dead. Angie’s had the opportunity to get personal reactions from the members of the various casts of shows she’s represented on shirts including the cast of The Walking Dead. She has branched out to sell her creations at the extremely popular zombie, horror and sci-fi fan conventions run by the company Walker Stalker. One of her favourite moments involves Norman Reedus of The Walking Dead, who took a photo with her daughter on his personal phone, after seeing her dressed as his character Daryl Dixon. While the celebrity reactions are always great she has also been touched by how her customers have embraced her products, including one fan who used her custom baby onesie as her pregnancy announcement. The interactions at conventions has also allowed for great opportunities, and Angie has some new designs in the works, including shirts featuring the shows Arrow and The Flash. Want to get up close and personal with Creative Par-Tees? In case you can’t see them in person and you want to purchase some of Creative Par-Tees creations they are available online here. Keep up to date with all their comings and goings by following them on Twitter and ‘Liking’ them on Facebook. TVDDallas was my third foray into the world of The Vampire Diaries conventions, from deciding to attend TVDDallas at the last-minute this convention was a whirlwind of surprises from start to finish. Beginning with the announcement of both Paul Wesley and Michael Trevino cancelling their appearances at the convention days before the event I was anxious about what this new convention venue would bring. 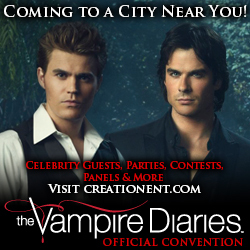 Creation Entertainment has been running conventions for years but has never hosted a TVD convention in Dallas. Being a new venue many of the attendees were first timers but luckily the Creation volunteers are more than equipped to handle all the confusion and questions any new convention goer may have. Being my third convention I can navigate the convention with confidence, no longer overwhelmed by the fun though albeit hectic schedule. TVDDallas had a slightly different set up due to the addition of new last-minute guests and a different hotel configuration but both changes made little impact on the enjoyment of the convention. Highlights of TVDDallas were numerous, from Steven McQueen joining the Hillywood girls as the hosted David Alpay’s panel, to Arielle Kebbel joining Zach Roerig and Steven in their panel. I was very fortunate to speak to many of the TVD cast members during the meet and greets, but also during the photo ops and autograph sessions. Dallas had a more relaxed feel than the previous two conventions I had attended, and the celebrities were more than happy to spend a little extra time with the guests especially during the Saturday night dance. Todd Williams, David Alpay, Trent Ford and Micah Parker spent the dance talking, taking pictures and even dancing with the guests! The addition of Trent Ford and Micah Parker was last-minute and I’m grateful for it, both gentlemen were personable and enjoy getting to interact with the guests, if you have the opportunity to attend a convention with either of these guests I highly recommend it. I am looking forward to seeing Trent at EyeCon and Micah was recently added to the guests at TVDOrlando. As much as it was exciting to interact with the celebrity guests I also enjoyed the time I spent with the other convention attendees, I was finally able to meet the lovely Ruthie who runs Vampire Diaries Online and has kindly allowed me to write a piece on her site. I was able to see my favorite Creation Entertainment people: phenomenal photographer Chris Schmelke, and the fabulous volunteers April and Libby, they truly make the convention experiences not only run smoothly but more fun. Dallas also surprised with their generosity and came out in strong support of Thunder Road, the film Charlie Bewley’s production company Astoria Entertainment is currently campaigning to raise funds for its production. Creation Entertainment held an auction for a dinner with Charlie for two guests in support of the campaign and the auction was won with a bid of $1300! The lucky winners were a lovely couple, Jason and Nicole Ross, Nicole is a therapist and director at The Creative Therapy Center. The Ross’ have become a great asset to the Thunder Road campaign holding fundraisers and helping promote wherever they can. I was fortunate enough to meet the lovely Robin Hefner who created the site Hico’s Hero and wanted to help support the campaign as her son was killed in action and knows many veterans who suffer from PTSD. Though I was apprehensive about going to this convention in the beginning, TVDDallas was a wonderful surprise and will always be one of my favorite conventions. What do you do April? Having been to two Creation Entertainment conventions for the Vampire Diaries this year I’m still rather new to the world of conventions. I was lucky enough to talk with one of the lovely volunteers who make the events run ever so smoothly. April Lawson Hancock is one of the many volunteers Creation employs to help in various positions during each convention. April started out as a fan herself when she attended a Twilight convention in 2010, and from then she was hooked. As a stay at home mom she rarely spent time away from her family but loved the convention environment so much that in 2012 she started to volunteer. As a volunteer April can be asked to cover many different duties depending on where she’s needed. She’s worked in the vendor’s room, security and her personal favorite; photo ops. When working as a photo-op volunteer her duties can include: ticket taking, line control, and helping the convention attendees through the photo-op process. April loves interacting with the fans and seeing their excitement during the events; getting to meet a lot of people is one of the best parts of her volunteering. She’s also made many lasting friendships through working the events. Though it may seem like it’s all fun there is some work involved and April’s least favorite part is the exhaustion that comes Monday morning when the convention’s over. For information on applying to volunteer. I’ve never been active in fandom, my love of television, movies, and books was a private, personal reverence. All this changed when I headed to Creation Entertainment’s Official Vampire Diaries Convention in Chicago on April 6&7, 2013. The Vampire Diaries is a supernatural drama on the CW Network that centers on a teenage girl named Elena Gilbert and the love triangle involving her and two vampire brothers, Damon and Stefan Salvatore. Being my first foray into the often crazy Fangdom, I was excited if not slightly apprehensive, but I boarded my flight with my freshly painted TVD nails and uncharacteristic optimism.